Zaminpira, S., et al. The Impact of Serotonin on the Cause and Treatment of Cancer. (2018) Int J Cancer Oncol 5(1): 1- 7. © 2018 Zaminpira, S. This is an Open access article distributed under the terms of Creative Commons Attribution 4.0 International License. This review article goes through many researches based on the effectiveness of the neurotransmitter serotonin on cancer cells and also the impact of SSRIs (selective serotonin reuptake inhibitors) drugs on the cause of certain types of cancers. Serotonin has been shown to be a mutagenic factor for a wide range of normal and tumor cells. Serotonin exhibits a growth stimulatory effect in aggressive cancers and carcinoids usually through 5- HT1 and 5-HT2 receptors. In contrast, low doses of serotonin can inhibit tumor growth via the decrease of blood supply to the tumor, suggesting that the role of serotonin on tumor growth is concentration-dependent. Serum serotonin level was found to be suitable for prognosis evaluation of urothelial carcinoma in the urinary bladder, adenocarcinoma of the prostate and renal cell carcinoma.The mechanism that connect serotonin with tumor evolution seem to be related to the serotonin impact on tumor associated macrophages. Carcinoid syndrome is a paraneoplastic syndrome comprising the signs and symptoms that occur secondary to carcinoid tumors. The syndrome includes flushing and diarrhea, and less frequently, heart failure, emesis and broncho constriction. It is caused by endogenous secretion of mainly serotonin and kallikrein. The carcinoid syndrome occurs in approximately 5% of carcinoid tumors and becomes manifest when vasoactive substances from the tumors enter the systemic circulation escaping hepatic degradation. Interestingly, if the primary tumor is from the GI tract (hence releasing serotonin into the hepatic portal circulation), carcinoid syndrome generally does not occur until the disease is so advanced that it overwhelms the liver’s ability to metabolize the released serotonin. Carcinoid tumors produce the vasoactive substance, serotonin. It is commonly, but incorrectly, thought that serotonin is the cause of the flushing. The flushing results from secretion of kallikrein, the enzyme that catalyzes the conversion of kininogen to lysyl-bradykinin. The latter is further converted to bradykinin, one of the most powerful vasodilators known. Other components of the carcinoid syndrome are diarrhea (probably caused by the increased serotonin, which greatly increases peristalsis, leaving less time for fluid absorption), a pellagra-like syndrome (probably caused by diversion of large amounts of tryptophan from synthesis of the vitamin B3niacin, which is needed for NAD production, to the synthesis of serotonin and other 5-hydroxyindoles), fibrotic lesions of the endocardium, particularly on the right side of the heart resulting in insufficiency of the tricuspid valve and, less frequently, the pulmonary valve and, uncommonly, bronchoconstriction. The pathogenesis of the cardiac lesions and the bronchoconstriction is unknown, but the former probably involves activation of serotonin 5-HT2B receptors by serotonin. When the primary tumor is in the gastrointestinal tract, as it is in the great majority of cases, the serotonin and kallikrein are inactivated in the liver; manifestations of carcinoid syndrome do not occur until there are metastases to the liver or when the cancer is accompanied by liver failure (cirrhosis). Carcinoid tumors arising in the bronchi may be associated with manifestations of carcinoid syndrome without liver metastases because their biologically active products reach the systemic circulation before passing through the liver and being metabolized.In most patients, there is an increased urinary excretion of 5-HIAA (5-hydroxyindoleacetic acid), a degradation product of serotonin.The biology of these tumors is interesting as it differs from many other tumor types. Ongoing research on the biology of these tumors may reveal new mechanisms for tumor development[9-11]. Tumor localization may be extremely difficult. Barium swallow and follow-up examination of the intestine may occasionally show the tumor. Capsule video endoscopy has recently been used to localize the tumor. Often laparotomy is the definitive way to localize the tumor. Another form of localizing a tumor is the Octreo - scan. A tracer agent of Indium 111 is injected into a vein where then the tumors absorb the radionuclide Indium 111 and become visible on the scanner. Only the tumors absorb the somatostatin agent Indium 111 making the scan highly effective[12,13]. Disease progression is difficult to ascertain because the disease can metastasize anywhere in the body and can be too small to identify with any current technology. Markers of the condition such as chromo-granin-A are imperfect indicators of disease progression.Prognosis varies from individual to individual. It ranges from a 95% 5-year survival for localized disease to an 80% 5-year survival for those with liver metastases. The average survival time from the start of octreotide treatment has increased to about 12 years[14,15]. The serotonin is secreted luminally and basolaterally which leads to increased serotonin uptake by circulating platelets and activation after stimulation, which gives increased stimulation of myenteric neurons and gastrointestinal motility. The remainder is synthesized in serotonergicneurons of the CNS, where it has various functions. These include the regulation of mood, appetite, and sleep. Serotonin also has some cognitive functions, including memory and learning. Modulation of serotonin at synapses is thought to be a major action of several classes of pharmacological antidepressants.Serotonin secreted from the enterochromaffin cells eventually finds its way out of tissues into the blood. There, it is actively taken up by blood platelets, which store it. When the platelets bind to a clot, they release serotonin, where it serves as a vasoconstrictor and helps to regulate hemostasis and blood clotting. Serotonin is also a growth factor for some types of cells, which may give it a role in wound healing. There are various serotonin receptors.Serotonin is metabolized mainly to 5-HIAA, chiefly by the liver. Metabolism involves first oxidation by monoamine oxidase to the corresponding aldehyde. This is followed by oxidation by aldehyde dehydrogenase to 5-HIAA, the indole acetic acid derivative. The latter is then excreted by the kidneys. In addition to animals, serotonin is found in fungi and plants. Serotonin’s presence in insect venoms and plant spines serves to cause pain, which is a side-effect of serotonin injection. Serotonin is produced by pathogenic amoebae, and its effect on the gut causes diarrhea. Its widespread presence in many seeds and fruits may serve to stimulate the digestive tract into expelling the seeds. The 5-HT receptors, the receptors for serotonin, are located on the cell membrane of nerve cells and other cell types in animals, and mediate the effects of serotonin as the endogenous ligand and of a broad range of pharmaceutical and hallucinogenic drugs. Except for the 5-HT3 receptor, a ligand-gated ion channel, all other 5-HT receptors are G-protein-coupled receptors (also called seven-trans membrane, or hepta helical receptors) that activate an intracellular second messenger cascade[28-30]. Serotonergic action is terminated primarily via uptake of 5-HT from the synapse. This is accomplished through the specific monoamine transporter for 5-HT, SERT, on the presynaptic neuron. Various agents can inhibit 5-HT reuptake, including cocaine, dextromethorphan (an antitussive), tricyclic antidepressants and selective serotonin reuptake inhibitors (SSRIs). A 2006 study conducted by the University of Washington suggested that a newly discovered monoamine transporter, known as PMAT, may account for a significant percentage of 5-HT clearance[31,32]. Contrasting with the high-affinity SERT, the PMAT has been identified as a low-affinity transporter, with an apparent Km of 114 μ-moles /l for serotonin; approximately 230 times higher than that of SERT. However, the PMAT, despite its relatively low serotonergic affinity, has a considerably higher transport ‘capacity’ than SERT, “resulting in roughly comparable uptake efficiencies to SERT in heterologous expression systems.” The study also suggests some SSRIs, such as fluoxetine and sertraline anti-depressants, inhibit PMAT but at IC50 values which surpass the therapeutic plasma concentrations by up to four orders of magnitude. Therefore, SSRI mono therapy is “ineffective” in PMAT inhibition. At present, no known pharmaceuticals are known to appreciably inhibit PMAT at normal therapeutic doses. The PMAT also suggestively transports dopamine and norepinephrine, albeit at Km values even higher than that of 5-HT (330 – 15,000 μ-moles/L)[36-38]. In animals including humans, serotonin is synthesized from the amino acid L-tryptophan by a short metabolic pathway consisting of three enzymes: tryptophan hydroxylase (TPH), aromatic amino acid decarboxylase (DDC) and pyridoxal phosphate. The TPH-mediated reaction is the rate-limiting step in the pathway. TPH has been shown to exist in two forms: TPH1, found in several tissues, and TPH2, which is a neuron-specific isoform[39,40]. Serotonin can be synthesized from tryptophan in the lab using Aspergillusniger and Psilocybecoprophila as catalysts. The first phase to 5-hydroxytryptophan would require letting tryptophan sit in ethanol and water for 7 days, then mixing in enough HCl (or other acid) to bring the pH to 3, and then adding NaOH to make a pH of 13 for 1 hour. Asperigillusniger would be the catalyst for this first phase. The second phase to synthesizing tryptophan itself from the 5-hydroxytryptophan intermediate would require adding ethanol and water, and letting sit for 30 days this time. The next two steps would be the same as the first phase: adding HCl to make the pH = 3, and then adding NaOH to make the pH very basic at 13 for 1 hour. This phase uses the Psilocybecoprophila as the catalyst for the reaction. Serotonin taken orally does not pass into the serotonergic pathways of the central nervous system, because it does not cross the blood–brain barrier. However, tryptophan and its metabolite5-hydroxytryptophan (5-HTP), from which serotonin is synthesized, does cross the blood–brain barrier. These agents are available as dietary supplements, and may be effective serotonergic agents. One product of serotonin breakdown is 5-hydroxyindoleacetic acid (5-HIAA), which is excreted in the urine. Serotonin and 5-HIAA are sometimes produced in excess amounts by certain tumors or cancers, and levels of these substances may be measured in the urine to test for these tumors. Consuming purified tryptophan increases brain serotonin where as eating foods containing tryptophan does not. This is because the transport system which brings tryptophan across the blood-brain barrier is also selective for the other amino acids contained in protein sources. High plasma levels of other large neutral amino acids compete for transport and prevent the elevated plasma tryptophan from increasing serotonin synthesis. Hua Sui et al in 2015 mentioned that overexpression of 5-hydroxytryptamine (5-HT) in human cancer contributes to tumor metastasis, but the role of 5-HT receptor family in cancer has not been thoroughly explored. Here, we report overexpression of 5-HT receptor (5-HT R) was associated with Wnt signaling pathway and advanced tumor stage. The underlying mechanism of 5-HT R-promoted tumor invasion was through its activation on the Axin1/β-catenin/MMP-7 pathway. In an orthotopic colorectal cancer mouse model, we demonstrated that a 5-HT R antagonist (GR127935) effectively inhibited tumor metastasis through targeting Axin1. Furthermore, in intestinal epithelium cells, we observed that 5-HT R played an important role in cell invasion via Axin1/β-catenin/MMP-7 pathway. Together, our findings reveal an essential role of the physiologic level of 5-HT R in pulmonary metastasis of colorectal cancer. Yi-Hsuan Hsieh et al informed that no epidemiological study has reported on whether an association between antidepressant exposure and gastric cancer exists. Herein, we aim to investigate the possible association between antidepressant exposure and gastric cancer incidence. We found antidepressant use did not increase the risk of gastric cancer. The lack of an association between antidepressant prescription and elevated gastric cancer incidence was apparent for across selective serotonin-reuptake inhibitors (SSRIs), tricyclic agents (TCAs), serotonin-norepinephrine reuptake inhibitors (SNRIs), and reversible inhibitors of monoamine oxidase A (RIMA), trazodone, mirtazapine and bupropion. There were slightly decreased gastric cancer risks of SSRIs use (ɘ28 DDD group, adjusted OR = 0.87; 95% CI = 0.78 – 0.96). Sensitive analysis showed SSRIs, TCAs, and SNRIs did not increase gastric cancer risks significantly even in the group with peptic ulcer history. Seyed Hesam Hejazi et al in 2014 mentioned that Breast cancer is a serious and potentially lethal multi-factor disease among 40-50 aged women in both developed and developing countries. Also, various studies have pointed to roles of neurotransmitters like serotonin in development of cancers, through action on various types of receptors. This study was conducted to evaluate serotonin receptor (5HT2AR and 5HT3AR) genes expression in peripheral blood mononuclear cells (PBMCs) of breast cancer patients in comparison with the healthy people and in the MCF7 cell line. Peripheral blood samples were obtained from 30 patients and 30 healthy individuals. Total RNA was extracted from PBMCs and MCF-7 cells and 5HT2AR and 5HT3AR were detected by RT-PCR techniques. Finally, serotonin receptor gene expression variation in breast cancer patients and MCF-7 cells were determined by real time-PCR. This latter indicated significant promotion in expression of 5HT3AR and 5HT2AR in PBMCs in breast cancer patients but expression of 5HT2AR in the MCF-7 cell line was significantly decreased. In conclusion, after performing complimentary tests, determine of gene expression changes in serotonin receptors (5HT2AR and 5HT3AR) may be useful as a new approach in treatment of breast cancer based on use of antagonists. Jessica Chubak et al in 2016 experiments shows that Women with breast cancer frequently use antidepressants; however, questions about the effect of these medications on breast cancer recurrence remain. Antidepressants overall, tricyclic antidepressants, and selective serotonin reuptake inhibitors were not associated with risk of breast cancer recurrence or mortality. Women taking paroxetine only (adjusted HR: 1.66; 95% CI: 1.02, 2.71) and trazadone only (adjusted HR: 1.76; 95% CI: 1.06, 2.92), but not fluoxetine only (adjusted HR: 0.92; 95% CI: 0.55, 1.53), had higher recurrence risks than antidepressant non-users. There was some suggestion of an increased recurrence risk with concurrent paroxetine and tamoxifen use compared to users of tamoxifen only (adjusted HR: 1.49; 95% CI: 0.79, 2.83). In general, antidepressants did not appear increase risk of breast cancer recurrence; though there were some suggested increases in risk that warrant further investigation in other datasets. Our results combined systematically and quantitatively with results from other studies may be useful for patients and providers making decisions about antidepressant use after breast cancer diagnosis. June Kuwahara et al in 2015 experimented that the anti-tumor effects of selective serotonin reuptake inhibitors (SSRIs) and serotonin and norepinephrine reuptake inhibitors (SNRIs) on several types of cancer cells have been reported. However, comparison of the anti-tumor effects of these drugs on human hepatocellular carcinoma (HepG2) cells has not been studied. We compared the anti-tumor effects of four SSRIs and two SNRIs on HepG2 cells. SSRIs and duloxetine dose-dependently decreased cell viability. Milnacipran had no effect on cell viability. The half-maximal inhibitory concentration was lower in the order of: sertraline, paroxetine, duloxetine, fluvoxamine, escitalopram, and milnacipran. Exposure to sertraline (2 µM) significantly increased caspase-3/7 activity. These results suggest that, of the agents tested here, sertraline had the highest sensitivity to HepG2 cells, and activation of the caspase pathway is involved in the anti-tumor effects of sertraline in HepG2 cells. Hepatocellular carcinoma (HCC) is the fifth most common cancer worldwide and the third most common cause of cancer-based death.1) globally, > 560000 people develop liver cancer each year and 550000 die from it. Chemotherapeutic agents against HCC have been studied extensively but they have never demonstrated improvement in overall survival compared with best supportive care. Sorafenib is a multi kinase inhibitor of the vascular endothelial growth factor receptor, platelet-derived growth factor receptor and Raf. It is the only agent that has been shown to improve overall survival and to be well tolerated in subjects with advanced-stage HCC with well-preserved liver function[6-8]. Selective serotonin reuptake inhibitors (SSRIs) and serotonin and norepinephrine reuptake inhibitors (SNRIs) are used for the treatment of depression, anxiety, and certain behavioral disorders. They are prescribed frequently for the treatment of depression in cancer patients. Recently, the anti-tumor effects of SSRIs have been reported against several types of cancer cells. Paroxetine is thought to evoke cell death via apoptosis on human osteosarcoma cells by activation of p38 mitogen-activated protein kinase (MAPK) and caspase-3 pathways. Fluoxetine has been shown to inhibit proliferation of prostate cancer cells in vitro and in vivo, and induction of apoptosis has been observed in glioma cells. Exposure to sertraline and paroxetine has been shown to yield considerable reduction in the viability of malignant T cells by increasing the activity of caspase-3 and decreasing expression of Bcl-2. Anti-tumor effects of SSRIs and SNRIs on human HCC cells are not known. Recent reports have suggested that sertraline induces apoptosis in the human HCC cell line HepG2 through the MAPK pathway. Mun et al. showed the apoptotic effect of fluoxetine against the HCC cell line Hep3B. However, comparison of anti-tumor effects of SSRIs and SNRIs on HepG2 cells has not been studied. Here, we compared the anti-tumor effects of four SSRIs (escitalopram, fluvoxamine, paroxetine, sertraline) and two SNRIs (duloxetine, milnacipran) on HepG2 cells. Bernhard Svejda et al mentioned that fibrosis is a cardinal feature of small intestinal neuroendocrine tumors (SI-NETs) both in local peritumoral tissue and systemic sites (cardiac). 5-HT, a commonly secreted NET amine, is a known inducer of fibrosis, although the mechanistic basis for it and growth factors regulating fibrosis and proliferation in the tumor microenvironment are unclear. We hypothesized that targeting 5-HT2B receptors on tumor cells would inhibit SI-NET 5-HT release and, thereby, fibroblast activation in the tumor microenvironment. In the 5-HT expressing SI-NET cell line, KRJ-I, PRX-08066 inhibited proliferation (IC 4.6 x 10 M) and 5-HT secretion (6.9 × 10 M) and decreased ERK1/2 phosphorylation and pro-fibrotic growth factor synthesis and secretion (transforming growth factor beta 1 [TGFβ1], connective tissue growth factor [CTGF] and fibroblast growth factor [FGF2]). In the KRJ-I: HEK293 co-culture system, PRX-08066 significantly decreased 5-HT release ( > 60%), Ki67 (transcript and immunostaining: 20% - 80%), TGFβ1, CTGF, and FGF2 transcription (20% - 50%) in the KRJ-I cell line. 5-HT itself stimulated HEK293 proliferation (25%) and synthesis of TGFβ1, CTGF and FGF2. PRX-08066 inhibition of KRJ-I function reversed these effects in the co-culture system. Targeting the 5-HT receptor may be an effective anti-proliferative and anti-fibrotic strategy for SINETs because it inhibits tumor microenvironment fibroblasts as well as NET cells. Fibrosis and proliferation appear to be biologically interfaced neuro endocrine neoplasia domains. CL Sanchez et al in 2015 showed that the neurotransmitters serotonin and dopamine both have a critical role in the underlying neurobiology of different behaviors. With focus on the interplay between dopamine and serotonin, it has been proposed that dopamine biases behavior towards habitual responding, and with serotonin offsetting this phenomenon and directing the balance toward more flexible, goal-directed responding. The present focus paper stands in close relationship to the publication by Worbe et al. (2015), which deals with the effects of acute tryptophan depletion, a neuro-dietary physiological method to decrease central nervous serotonin synthesis in humans for a short period of time, on the balance between hypothetical goal-directed and habitual systems. In that research, acute tryptophan depletion challenge administration and a following short-term reduction in central nervous serotonin synthesis were associated with a shift of behavioral performance towards habitual responding, providing further evidence that central nervous serotonin function modulates the balance between goal-directed and stimulus-response habitual systems of behavioral control. In the present focus paper, we discuss the findings by Worbe and colleagues in light of animal experiments as well as clinical implications and discuss potential future avenues for related research. Jaya Gautam et al in 2016 experimented that Triple-negative breast cancer (TNBC) have a high risk of relapse and there are few chemotherapy options. Although 5hydroxytryptamine (5-HT, serotonin) signaling pathways have been suggested as potential targets for anti-cancer drug development, the mechanism responsible for the action of 5-HT in TNBC remains unknown. TNBC cell lines (MDA-MB-231, HCC-1395, and Hs578T) expressed higher levels of tryptophan hydroxylase 1 (TPH1) than hormone-responsive breast cancer cell lines (MCF-7 and T47D). In MDA-MB-231 cells, 5-HT promoted invasion and proliferation via 5-HT receptor, and interestingly, the stimulatory effect of 5-HT on MDA-MB-231 cell invasion was stronger than its effect on proliferation. Likewise, downstream signaling pathways of 5-HT differed during invasion and proliferation, that is, Gα-activated cAMP and Gβγ-activated kinase signaling during invasion, and Gβγ-activated PI3K /Akt signaling during proliferation. Also, 5-HT increased the protein expressions of TPH1 and VEGF in MDA-MB-231 cells. These results provide insight of the stimulatory effect of 5-HT on breast cancer progression; 5-HT was found to act more strongly during the first stage of metastasis (during invasion and migration) than during the later proliferative phase after local invasion. Interestingly, these actions of 5-HT were inhibited by BJ-1113, a 6-amino-2, 4, 5-trimethylpyridin-3-ol analog. BJ-1113 blocked intracellular signaling pathways initiated by 5-HT receptor activation, and exhibited anti-proliferative and anti-invasive activities against MDA-MB-231 cells. Furthermore, the inhibitory effect of BJ-1113 against MDA-MB-231 tumor growth was greater than that of SB269970, a 5HT receptor antagonist. 5-HT receptor which mediates 5-HT-induced cancer progression is a potential therapeutic target in TNBC, and BJ-1113 offers a novel scaffold for the development of anti-cancer agents against TNBC. In conclusion, SSRIs may lead to both tumor progression and tumor inhibition via two different mechanisms and it is a matter of luck and probably tumor type regarding which of the mechanism will dominate. If the immune system is already suppressed due to chemo or other reasons, using SSRIs may help. If the immune system is in a good shape, SSRIs would better to be avoided. Chloroquine may also have immunosuppressive activity. Next to its serious anti-cancer potential, there may also be a negative impact on the immune system. Some of the best ways to address the influence of serotonin in cancer is via the inhibition of 5-HT receptors over expressed in many tumor types and not via the inhibition of serotonin transporter. From a 5-HTR inhibition point of view; we would probably suggest the use of Cyproheptadine in combination with Propranolol. These should address both 5-HT-1 and 5-HT-2 receptors, which seem to be the most relevant in most cancers. Serotonin was shown to suppress MMP-12 production in tumor associated macrophages and as a result inhibit the generation of angiostatin. Conversely, the inhibition of serotonin leads to angiostatin production which reduces tumor growth due to angiostatin’s angiogenesis inhibition activity. Therefore, this effect is related to the tumor associated macrophages. serotonin directly impacts on cell growth via binding to its receptors. The 5-HT-1 and 5-HT-2 receptors are extensively expressed in the human breast cancer, prostate cancer, bladder cancer cells and other cancer types. Serotonin direct impact on vessels per fusing the tumor and Intra-vital microscopy studies have also shown that vessels per fusing the tumor exhibit a specific vasconstrictive response to 5HT1 agonists. In line with the above, during tumor progression, tyrosine hydroxylase, the rate-limiting enzyme in the serotonin biosynthesis pathway, is often up-regulated. Acknowledgement: We would like to thank the Violet Cancer Institute (VCI) for its sponsorship in this research. Conflicts of Interest: There are no conflicts of interest between the authors of this article. Soga. J., Yakuwa, Y., Osaka, M. Carcinoid syndrome: a statistical evaluation of 748 reported cases. (1999) J Expt Clin Cancer Res 18(2): 133–141. Kumar, V., Abbas, Abul, K., et al. Robbins Basic Pathology (8th ed). Philadelphia: Saunders. Warrell, D.A., Cox, T.M., Firth, J.D. Oxford Textbook of Medicine (8th ed). (2010) Oxford University Press. Goljan, E. Pathology, 2nd ed Mosby Elsevier, Rapid Review series. Cunningham, J.L., Janson, E.T. The biological hallmarks of ileal carcinoids. (2011) Eur J Clin Invest 41(12): 1353–1360. FDA Approves Xermelo for Carcinoid Syndrome Diarrhea”. (2017) U.S. Food and Drug Administration. Nobels, F.R., Kwekkeboom, D.J., Bouillon, R., et al. Chromogranin A: its clinical value as marker of neuroendocrine tumours. (1998) Eur J Clin Inv 28(6): 431–440. Carrasco, C.H., Charnsangavej, C., Ajani, J., et al. The carcinoid syndrome: palliation by hepatic artery embolization. (1986) AJR Am J Roentgenol 147(1): 149–154. Mabvuure, N., Cumberworth, A., Hindocha, S. In patients with carcinoid syndrome undergoing valve replacement: will a biological valve have acceptable durability? (2012) Interact Cardiovasc Thorac Surg 15(3): 467–471. King, M.W. Serotonin. The Med Biochem Page. Berger, M., Gray, J.A, Roth, B.L, et al. The expanded biology of serotonin. (2009) Annu Rev Med 60: 355–366. Yano, J.M., Yu, K., Donaldson, G.P., et al. Indigenous Bacteria from the Gut Microbiota Regulate Host Serotonin Biosynthesis. (2015) Cell 161(2): 264–276. Kang, K., Park, S., Kim, Y.S., et al. 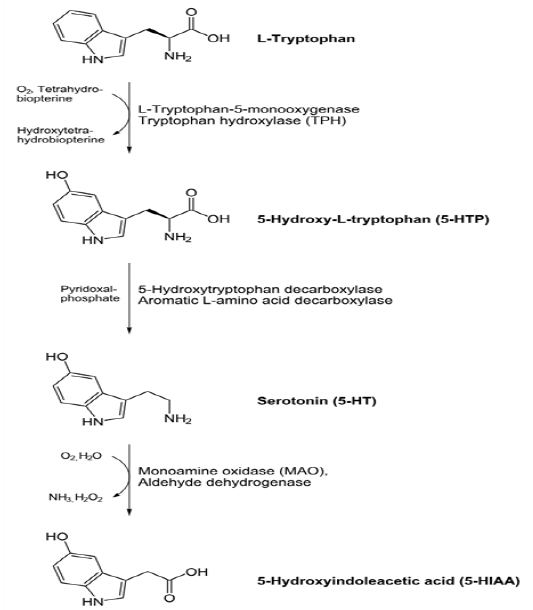 Biosynthesis and biotechnological production of serotonin derivatives. (2009) Appl Microbiol Biotechnol 83(1): 27–34. Hannon, J., Hoyer, D. Molecular biology of 5-HT receptors. (2008) Behav Brain Res 195(1): 198–213. Zhou, M., Engel, K., Wang, J. Evidence for significant contribution of a newly identified monoamine transporter (PMAT) to serotonin uptake in the human brain. (2007) Biochem Pharmacol 73(1): 147–154. Paulmann, N., Grohmann, M., Voigt, J.P., et al. Intracellular serotonin modulates insulin secretion from pancreatic beta-cells by protein serotonylation. (2009) PLoS Biol 7(10):e1000229. Roth, B.L., Driscol, J. PDSP Ki Database. Psychoactive Drug Screening Program (PDSP). (2011) University of North Carolina at Chapel Hill and the United States National Institute of Mental Health. Retrieved 17 December 2013. Frost, M., Andersen, T.E., Yadav, V., et al. Patients with high-bone-mass phenotype owing to Lrp5-T253I mutation have low plasma levels of serotonin. (2010) J Bone Miner Res 25(3): 673–675. Rosen, C.J. Breaking into bone biology: serotonin’s secrets. (2009) Nat Med 15(2): 145–146. Mödder, U.I., Achenbach, S.J., Amin, S., et al. Relation of serum serotonin levels to bone density and structural parameters in women. (2010) J Bone Miner Res 25(2): 415–422. Frost, M., Andersen, T., Gossiel, F., et al. Levels of serotonin, sclerostin, bone turnover markers as well as bone density and microarchitecture in patients with high bone mass phenotype due to a mutation in Lrp5. (2011) J Bone Miner Res 26(8): 1721–1728. Kode, A., Mosialou, I., Silva, B.C., et al. FOXO1 orchestrates the bone-suppressing function of gut-derived serotonin. (2012) J Clin Invest 122(10): 3490–3503. Yadav, V.K., Balaji, S., Suresh, P.S., et al. Pharmacological inhibition of gut-derived serotonin synthesis is a potential bone anabolic treatment for osteoporosis. (2010) Nat Med 16(3): 308–312. Ozanne, S.E., Hales, C.N. Lifespan: catch-up growth and obesity in male mice. (2004) Nature 427(6973): 411–412. Lewis, D.S., Bertrand, H.A., McMahan, C.A., et al. Preweaning food intake influences the adiposity of young adult baboons. (1986) J Clin Invest 78 (4): 899–905. Hahn, P. Effect of litter size on plasma cholesterol and insulin and some liver and adipose tissue enzymes in adult rodents. (1984) J Nutr 114(7): 1231–1234. Popa, D., Léna, C., Alexandre, C., et al. Lasting syndrome of depression produced by reduction in serotonin uptake during postnatal development: evidence from sleep, stress, and behavior. (2008) J Neurosci 28(14): 3546-3554. Maciag, D., Simpson, K.L., Coppinger, D., et al. Neonatal Antidepressant Exposure has Lasting Effects on Behavior and Serotonin Circuitry. (2006) Neuropsychopharmacology 31(1): 47-57. Maciag, D., Williams, L., Coppinger, D., et al. Neonatal citalopram exposure produces lasting changes in behavior that are reversed by adult imipramine treatment. (2006) Eur J Pharmacol 532(3): 265-269. Holden, C. Neuroscience. Prozac treatment of newborn mice raises anxiety. (2004) Science 306(5697): 792. Ansorge, M.S., Zhou, M., Lira, A., et al. Early-life blockade of the 5-HT transporter alters emotional behavior in adult mice. (2004) Science 306(5697): 879-881. Lesurtel, M., Graf, R., Aleil, B., et al. Platelet-derived serotonin mediates liver regeneration. (2006) Science 312(5770): 104-107. Matondo, R.B., Punt, C., Homberg, J., et al. Deletion of the serotonin transporter in rats disturbs serotonin homeostasis without impairing liver regeneration. (2009) Am J Physiol Gastrointest Liver Physiol 296(4): 963-968. Collet, C., Schiltz, C., Geoffroy, V., et al. The serotonin 5-HT2B receptor controls bone mass via osteoblast recruitment and proliferation. (2008) FASEB J 22(2): 418-427. Yadav, V.K., Ryu, J.H., Suda N, et al. Lrp5 controls bone formation by inhibiting serotonin synthesis in the duodenum. (2008) Cell 135(5): 825-837. McDuffie, J.E., Motley, E.D., Limbird, L.E., et al. 5-hydroxytryptamine stimulates phosphorylation of p44/p42 mitogen-activated protein kinase activation in bovine aortic endothelial cell cultures. (2000) J Cardiovasc Pharmacol 35(3): 398–402. Marieb, Elaine, Nicpon. Essentials of human anatomy & physiology (2009) (Eighth ed.). San Francisco: Pearson/Benjamin Cummings. p. 336. Titeler, M., Lyon, R.A., Glennon, R.A., et al. Radioligand binding evidence implicates the brain 5-HT2 receptor as a site of action for LSD and phenylisopropylamine hallucinogens. (1988) Psychopharmacology (Berl) 94(2): 213–216. Savelieva, K.V., Zhao, S., Pogorelov, V.M., et al. Genetic disruption of both tryptophan hydroxylase genes dramatically reduces serotonin and affects behavior in models sensitive to antidepressants. (2008) PLoS One 3(10): 3301. Wurtman, R.J., Hefti, F., Melamed, E. Precursor control of neurotransmitter synthesis. (1980) Pharmacol Rev 32(4): 315–335. Negri, L. Vittorio Erspamer (1909–1999). (2006) Med Secoli 18(1): 97–113. Rapport, M.M., Green, A.A., Page, I.H. Serum vasoconstrictor, serotonin; isolation and characterization. (1948) J Biol Chem 176(3): 1243–1251. Hua, Sui., Hanchen, Xu., Qi, Li., et al. 5-hydroxytryptamine receptor (5-HT R) promotes colorectal cancer metastasis by regulating Axin1/β-catenin/MMP-7 signaling pathway. (2015) Oncotarget 6(28): 25975–25987. Hsieh, Y.H., Chiu, W.C., Chen, V.C.H., et al. Antidepressants and Gastric Cancer: A Nationwide Population-Based Nested Case-Control Study. (2015) PLoS One 10(11): e0143668. Hejazi, S.H., Ahangari, G., Pornour, M., et al. Evaluation of Gene Expression Changes of Serotonin Receptors, 5-HT3AR and 5-HT2AR as Main Stress Factors in Breast Cancer Patients. (2015) Asian Pac J Cancer Prev 15(11): 4455-4458. Chubak, J., Bowles, E.J.A., Denise M., et al. Breast cancer recurrence in relation to antidepressant use. (2016) Cancer Causes Control 27(1): 125–136. Kuwahara, J., Yamada, T., Egashira, N., et al. Comparison of the Anti-tumor Effects of Selective Serotonin Reuptake Inhibitors as Well as Serotonin and Norepinephrine Reuptake Inhibitors in Human Hepatocellular Carcinoma Cells. (2015) Biol Pharm Bull 38(9): 1410-1414. Svejda, B., Kidd, M., Giovinazzo, F., et al. The 5-HT receptor plays a key regulatory role in both neuroendocrine tumor cell proliferation and the modulation of the fibroblast component of the neoplastic microenvironment. (2010) Cancer 116(12): 2902-2912. Sanchez, C.L., Biskup, C.S., Zepf, F.D. The Role of Serotonin (5-HT) in Behavioral Control: Findings from Animal Research and Clinical Implications. (2015) Int J Neuropsychopharmacol1 8(10): pyv050. Gautam, J., Banskota, S., Jung-Ae Kim. Tryptophan hydroxylase 1 and 5-HT receptor preferentially expressed in triple-negative breast cancer promote cancer progression through autocrine serotonin signaling. (2016) Mol Cancer 15(1): 75.